Generally, the fewer animals that have taken up residence in your attic, the lower the cost. We always recommend acting quickly when rodents like rats or mice have invaded your property because of how quickly they reproduce. Not only does this increase their potential for doing damage, but can also increase the cost to remove them. The type of animal you’re dealing with is also important. From mice to raccoons, the critters that commonly make their way into homes varies hugely. Before we remove any animals from your home, during the inspection phase, we will need to determine what condition the invading animals are in. Cost will vary depending on if the animal is healthy, sick, aggressive, or dead, because of the different tools and techniques needed to remove them safely. Working in a cramped or unsafe attic space often requires additional time and tools to safely resolve an infestation, which can in turn affect the overall cost. The same goes for adverse weather conditions that impede a technician’s ability to get the job done efficiently. 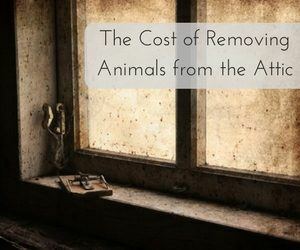 While we cannot give exact pricing without first conducting an inspection, most of our customers pay somewhere in the $100-$300 range for their animal removal needs. To keep costs as low as possible, if you suspect that you have an infestation, do not wait to take action. Give Critter Control® of Orlando a call today at 407-295-7194 with any questions, or to schedule your home consultation.